I have outlined the vegan options Pho Xpress has to offer below. The tofu spring rolls come with fried tofu, vermicelli noodles, leaf lettuce, cucumbers and mint, wrapped in rice paper. My flat noodle Xpress plate featured flat noodles, stir-fried broccoli, bell peppers, spring onions, bean sprouts, bok choy and fried tofu. They are served with a peanut dipping sauce. I didn’t feel like getting an appetizer, so I didn’t try these. These customize-able plates can be ordered two ways for vegans! 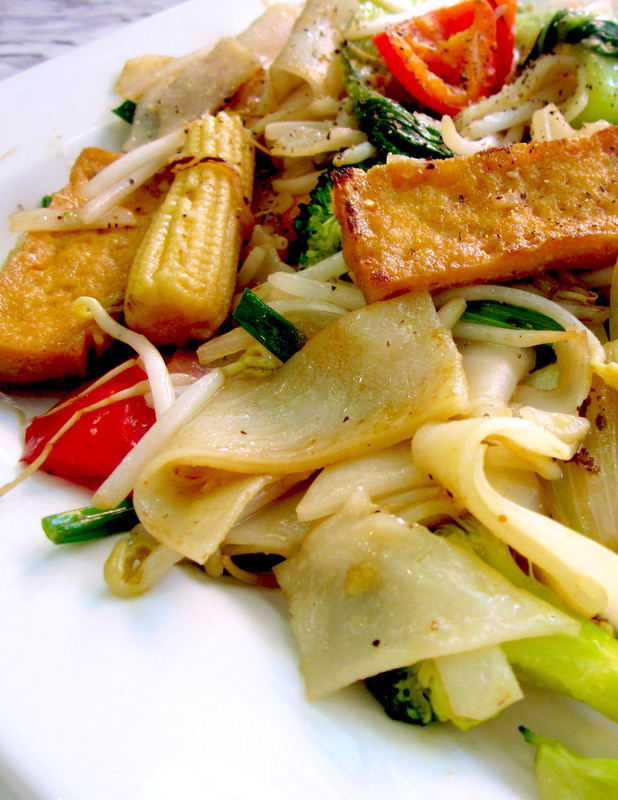 We can choose fried rice or flat noodles, with veggies and tofu. You have to be sure to remind them not to cook the dish with egg, because that is the default. During the lunch hour, they can get pretty busy, so I was told that in the future, I could place my order with a no-egg request at the register further down the line. I ordered a flat noodle Xpress plate with no egg, pictured on the right. This colorful dish was tasty, and especially satisfying with a dash of lime. I’d order it again if I had to eat near campus. Finally, the main focus of this post! I appreciated the manager’s helpfulness in telling me about the ingredients in the vegetarian phở, and he even brought me extra limes upon request. I am a lime fanatic, especially when it comes to noodles. 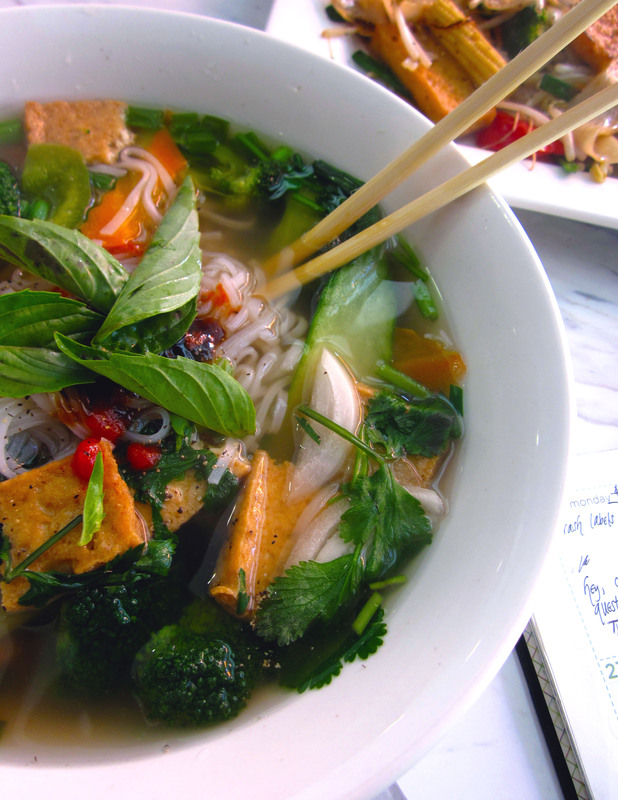 As you probably guessed, the vegetarian phở at PhoXpress is vegan-friendly, and it comes with veggies and pan-fried tofu. I have definitely had tofu in my phở before, but never have I had so many steamed vegetables as toppings. Vegan phở, made with vegetable broth, tofu and steamed veggies. The greenest bowl of phở! 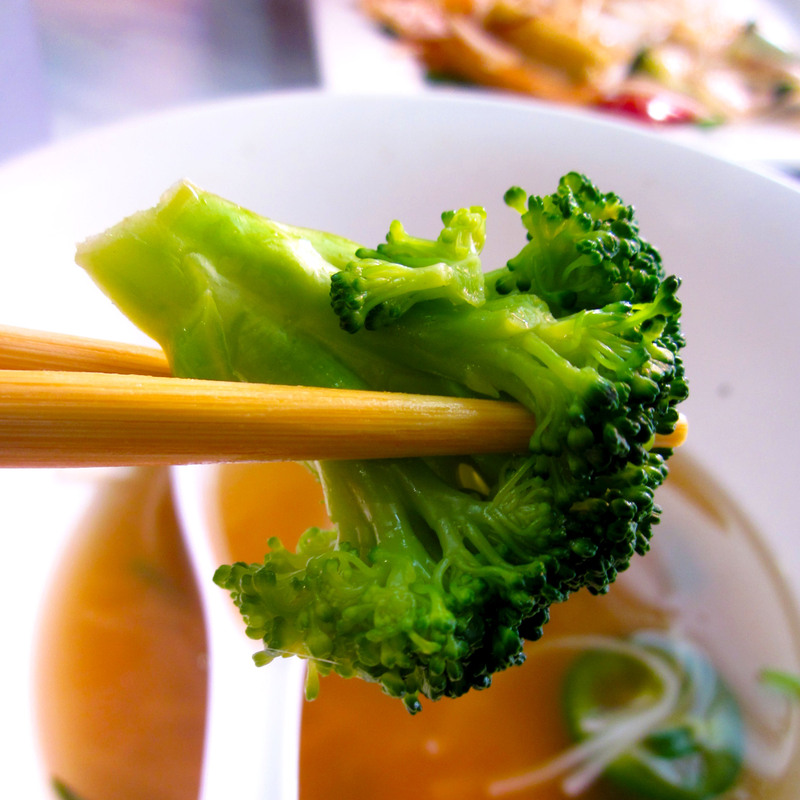 How fitting that there was broccoli in my phở while I was reviewing it for The Broccoli Bulletin! The green in my family’s phở typically comes from basil, coriander, spring onions and Mexican coriander. Seeing broccoli and bok choy in the dish was ultimately strange for me. I just personally don’t associate those vegetables with phở. The toppings also included carrots and mushrooms, which I’ve seen. The steamed veggie medley was actually not a bad addition, but I feel it would be more suited to phở’s cousin, hủ tiếu. 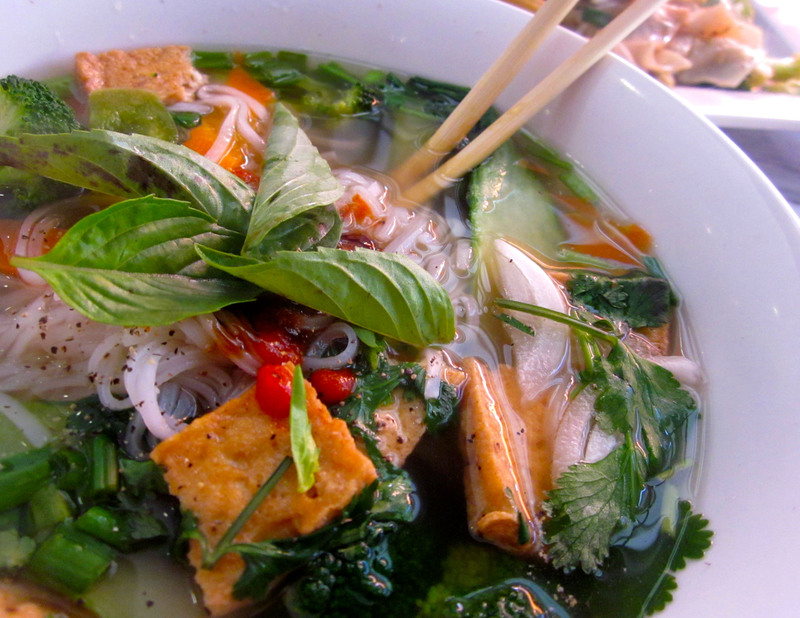 In any case, the most important indicator of a proper bowl of phở is the broth. The soup was made with vegetable broth and key spices, such as star anise. I could definitely tell the spices were there, but the aroma was just not strong enough for me. I suppose it must be because I am so accustomed to the pungency of my family’s phở broth. To conclude, I definitely would not call this phở, but it’s a nice noodle soup if you need something to warm yourself up between classes. The smoothies on the drink menu can be ordered without milk. The business has experimented with flax milk in the past and might consider the possibility of using soymilk or another milk alternative in the future. I didn’t think PhoXpress would be on my vegan list, but it turns out I was wrong! 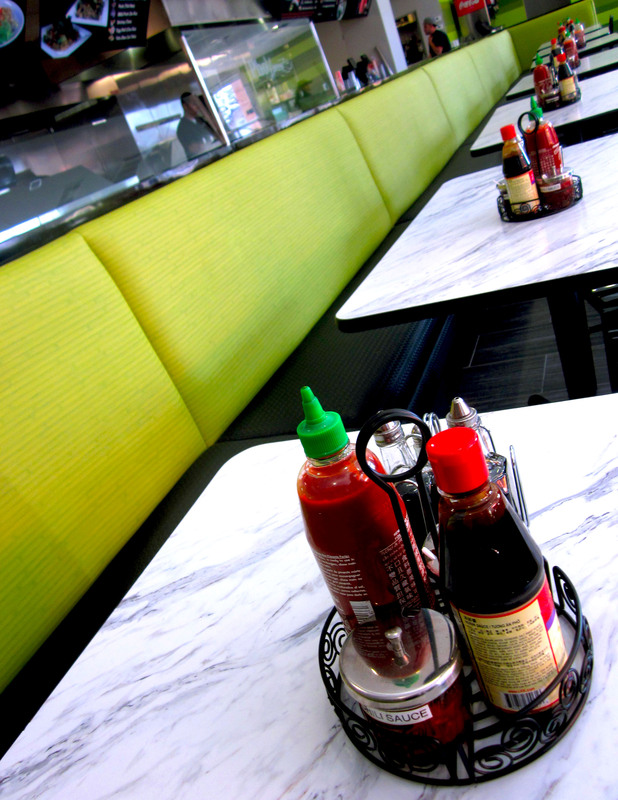 PhoXpress is still working on expanding their vegan options in other ways–currently, they are looking into vegan alternatives for the vermicelli and bánh mì. I suggested Vin to check out D’Vegan’s menu for inspiration. Besides the vegan options, I wholeheartedly appreciated PhoXpress for their friendly staff. I am excited about returning to see what other vegan alternatives they come up with for the menu! I’ll be posting more vegan reviews of College Park’s businesses soon. Meanwhile, please check out my posts about the options at Cool Berry and Pie Five Pizza. EDIT (6/10/13): As of late Spring 2013, I regret to report that PhoXpress no longer offers vegan-friendly flat noodles because their chef is usually out so they cannot accommodate vegan flat noodle requests. They still have vegan phở, but they are out of tofu more often than not. I have been there several times in between classes (lunch, dinner, in between) with no success–just a warning to the vegans and vegetarians on campus! This place does not have my full recommendation, because of its lack of options and convenience. haha, thanks Eric! 🙂 Let’s go with V soon!